The Pretoria side defeated the Madibaz in front of a large, vocal and partisan crowd at the LC de Villiers Sports Grounds. It was a well-deserved victory in which the hosts created far more chances and were much more physical than their visiting opponents. NMMU were unbeaten before the event decider and went into the match with a lot of confidence. They had a good start to the final and created the first real chance, but Tuks slowly worked their way back into the match, with the Pretoria midfielders especially coming to the fore. Tuks got their reward in the 20th minute, when Lawrence Ntswane opened the scoring with a header. Ntswane was on the receiving end of a wonderful cross from Mbongeni Masilela and easily beat the NMMU keeper. That goal really got Tuks’ tail in the air, and they kept pushing the Madibaz defence to their limit. They had another three shots on goal before doubling their lead in the 44th minute, through the boot of Claudio Barreiro. Ntswane was instrumental in Barreiro’s goal. He fired a shot into the body of the goalkeeper, who deflected the ball straight to Barreiro. The teams went into half-time with the score 2-0 in Tuks’ favour, and it was clear NMMU had a mountain to climb. They never really seemed up for the challenge, though, and struggled for direction in the first 30 minutes of the second half. Tuks extended their lead in the 72nd minute, when Masilela finished off a well-worked move in which Dean Wilkinson and Jarryd van den Berg exploited some space. That goal effectively ended any further hopes NMMU’s fans might have had, and even though Bradley Peterson pulled one back in the 78th minute, there was never a sense that the Eastern Cape side could mount a comeback. Their players were often isolated and had no answer for Tuks’ constant physicality. Their pain was further compounded with the last move of the competition, when Masilela went on the run and completed his brace with a wonderful individual goal. 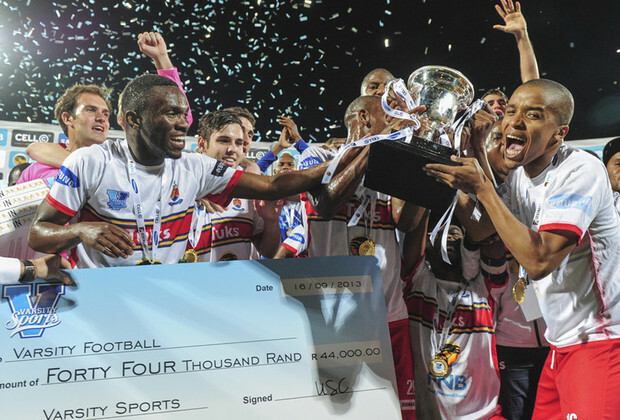 Masilela was a constant thorn in the NMMU side, while the Tuks captain, Kabelo Ramongane and Van den Berg were also masterful. Van den Berg was named Man of the Match. The women's title was won by the University of Johannesburg (UJ), who embarrassed the Tshwane University of Technology (TUT) with a massive winning score of 6-0. Five goals in the first half and one right at the end of the match saw UJ take the title at a canter. The UJ scorers were Disebo Mametja (2), Amanda Dlamini, Presocious Matabologa, Noko Matlou (2).